WHAT?!? Two posts in one week?? This has to be a record for me. But seriously… our house is on cupcake overload! I’m planning a baby shower for the sweetest girl, and couldn’t serve cupcakes that haven’t passed the four year old’s taste test. That is where these cupcakes come in. 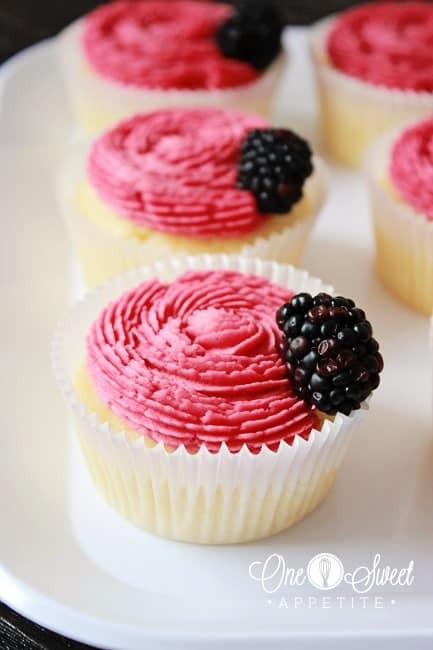 She suggested strawberry lemonade cupcakes… but when I got to the store a giant carton of blackberries were staring me right in the face… They happen to be one of my favorite fruits, so how could I say no?? Preheat your oven to 350 degrees. Line a muffin tin with paper liners and set aside. 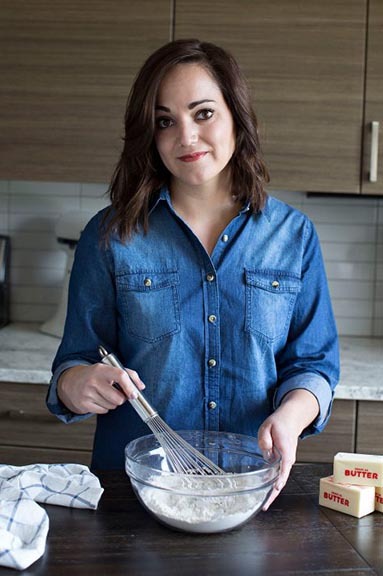 Whisk together your flour, baking powder, and baking soda in a medium sized bowl. Set to the side. Cream together the butter and sugar in the bowl of your electric mixer. Add the eggs, yogurt, lemon juice, and zest. Mix to combine. Slowly add the dry ingredients until fully incorporated. Fill your liners 3/4 full, and bake for 15-18 minutes. Cool completely before frosting. Combine all of the ingredients in a medium sauce pan. Bring to a boil, and continue to cook until slightly thickened. Cool briefly then transfer to a cheesecloth. Squeeze all of the juice into a container and transfer to the refrigerator to cool. Cream together the butter and powdered sugar. Slowly add in the blackberry sauce and whip until light and fluffy. The best part about these cupcakes? That they are so adaptable! Don’t love the blackberry? Switch it out for strawberries… raspberries… or how about cherries? Or just enjoy the cake with a little whipped cream. Lemon is a spring time flavor that I truly look forward too. Anything citrus is welcome in our home. Jeseca, These look seriously amazing! I’m glad that you didn’t overload the cupcakes with too much frosting, I can’t eat them when the frosting is miles (or inches) high. Lemonade cupcakes sound so refreshing! This is the perfect spring or summer treat! These look amazing!! Thanks for sharing, can’t wait to try them! These couldn’t look more gorgeous or enticing! I pinned this. These are so pretty and they look delicious! 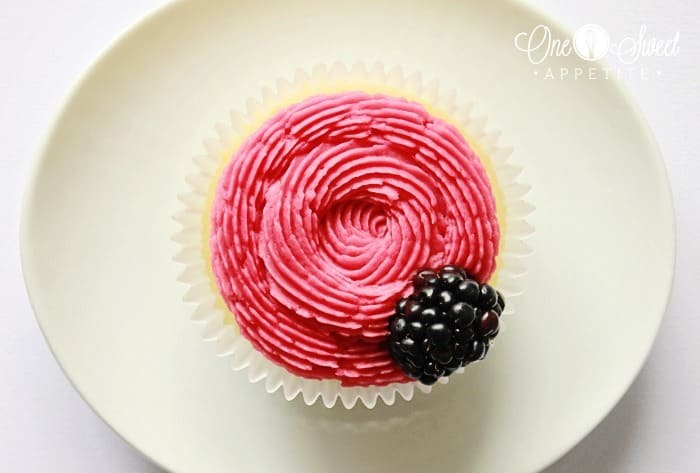 I am always looking for new cupcake ideas, and this looks scrumptious! I love blackberries. Just pinned and will be trying these very soon. These are almost too cute to eat! 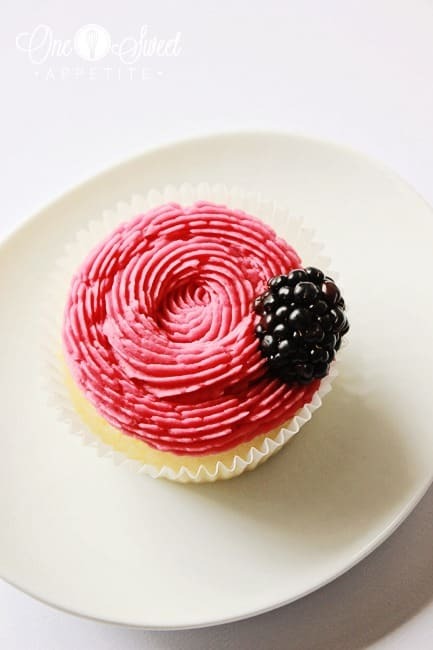 Almost 😉 I love blackberries but have never had them in a cupcake before. Must try it! I was a little worried, but it’s actually really good. You can change the blackberries for any other berry which is nice. I want to say 12 to 15. I’ll have to remake them to be sure. It was a while ago. I have a question. When you say 2 eggs and one yolk, is that 2 full eggs and one yolk or is it 2 egg whites and one yolk? Great question. It’s two full eggs and one yolk. I typically use large, but have used extra large on accident a few times with no problems. Substituted raspberries for the blackberries and took these into work. Everyone asked for the recipe! Would it be ok to make the icing up the day before you need it and keep in fridge? I make frosting a few days before, so that should be fine. 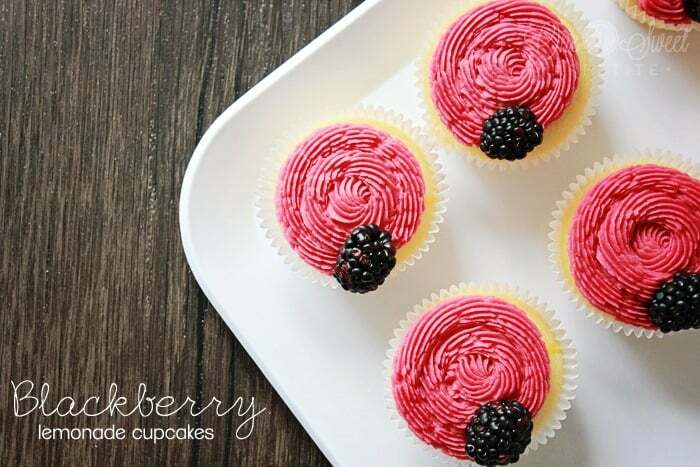 Just make sure you whip it again before topping the cupcakes. I’m assuming the little “t” means teaspoons…is this correct? It does. I’m in the process of changing over all of these recipes to actually spell out teaspoon and tablespoon. Thanks for being patient! Hi again…why do we have the extra egg yolk? can i skip it? Altering the recipe is up to you. I suggest sticking with the way it was written for the best taste and quality.